The Italian premiere of the International Media Mixer project on Sunday March 11, 2018 was such a powerful experience—it’s difficult to put it into words. If you aren’t familiar with the project you can read more about it here. CFA’s Media Mixer project began in 2013 as a way to inspire the creative reuse of our films by contemporary artists working in video and sound. With the generous support of the MacArthur Foundation’s International Connections Fund, this was our first international iteration of the project, and it has been an enormous success! We worked with independent curator Karianne Fiorini to invite two filmmakers based in Chicago, Lori Felker and Domietta Torlasco, to create two new videos using footage from the Lab 80 film – Cinescatti archive, and three filmmakers based in Italy, Yan Cheng & Federico Francioni and Giuseppe Boccassini, to create two new videos using footage from CFA’s archive. The filmmakers were asked to explore, use and interpret this material—from another culture, another country and another era—as they liked. We then paired the US-based filmmakers with Italian musicians and the Italian-based filmmakers with Chicago-based musicians to create soundtracks for the new video pieces. This resulted in a truly collaborative project that brought together artists in Italy and Chicago, as well as our two regional film archives based in Chicago and Bergamo. Four new videos were created by these talented artists. We are in awe of their dedication to the archival film material and their hard work, generosity, and creativity. 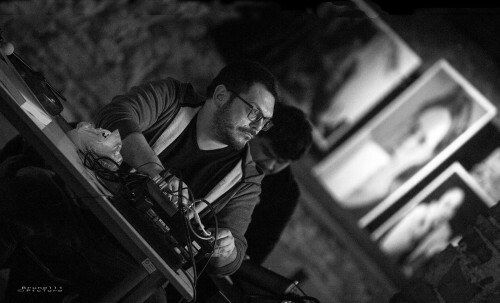 Sound musicians Alex Inglizian and Tomeka Reid (joined by Nick Mazzarella) travelled from the US to Italy where they met their Italian counterparts Patrizia Oliva and Stefano Urkuma De Santis for the first time. Sunday began with a lovely lunch hosted by Lab 80 film (thank you to everyone at Lab80, Sergio Visinoni & Giulia Castelletti) where we were finally all in the same room. We got to know one another in the best possible way – over a delicious meal of food from the Puglia region of Italy! 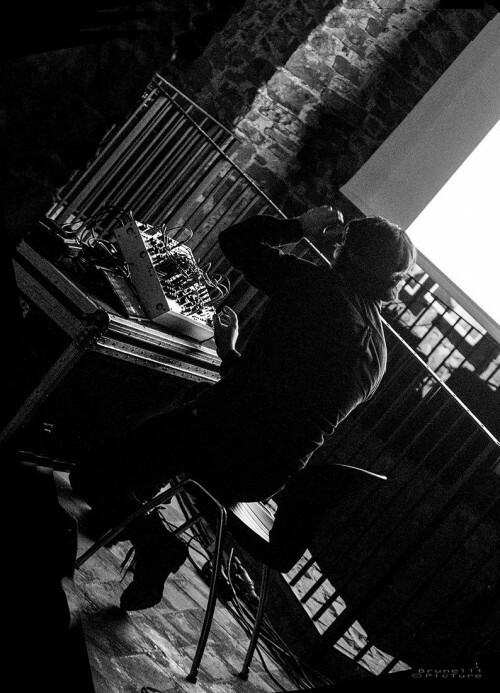 After working primarily over email (and across the Atlantic Ocean), this was the first time that sound artists Alex Inglizian and Tomeka Reid met their collaborative partners Giuseppe Boccassini, Federico Francioni, and Yan Cheng. We had a lovely time and quickly moved over to the beautiful festival exhibition space, the Salla Alla Porta S. Agostino (an arched passageway built in 1781 as an armed gate for the Venetian Walls that surround Bergamo’s Cittá Alta) to sound check. Photo by Giancarlo Brunelli. 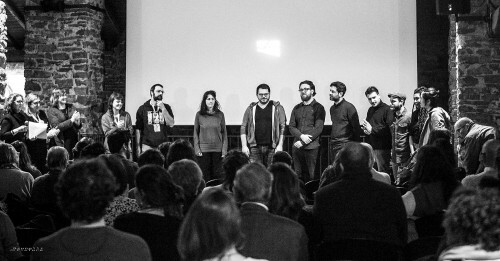 L-R: Curator Karianne Fiorini, BFM translator, CFA curator Michelle Puetz, Giulia Casteletti (Lab 80 film – Cinescatti), Sergio Visinoni (Lab 80 film – Cinescatti & BFM), Patrizia Oliva, Stefano Urkuma De Santis, Alex Inglizian, Giuseppe Boccassini, Federico Francioni, Nick Mazzarella, Tomeka Reid, Yan Cheng. Photo by Giancarlo Brunelli. 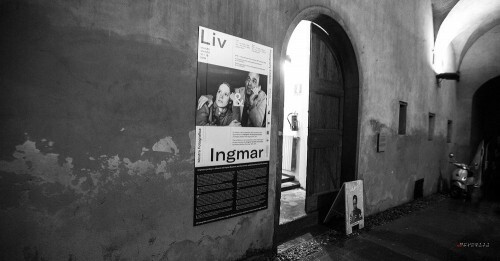 Entrance to the Salla Alla Porta S. Agostino and a poster for the festival’s exhibition dedicated to the work of Liv Ullmann and Ingmar Bergman. 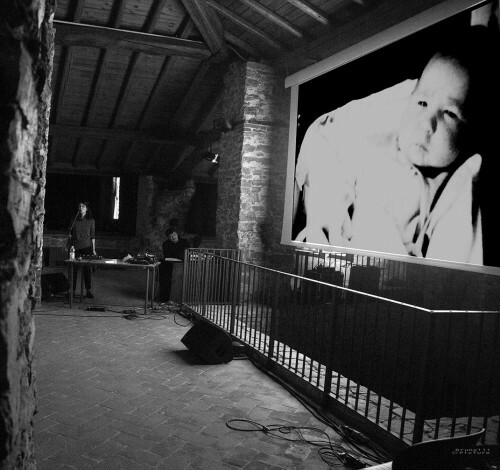 The event began at 7:15 and, following an introduction by the team from Lab 80 film – Cinescatti, Bergamo Film Meeting festival director Angelo Signorelli, and curators Karianne Fiorini and Michelle Puetz, we moved into the screening and performance. 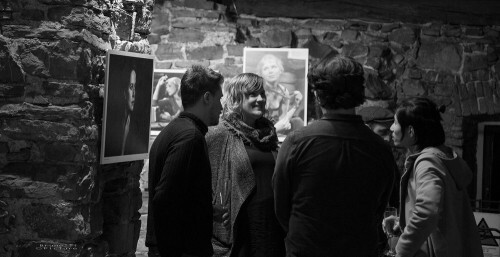 Each piece was introduced by the artists in attendance, who provided insight into the works and their collaborative process. A heavy rain outside created a haunting atmosphere for the screening. The crowd was great, and each piece looked and sounded beautiful. The live performances by Alex Inglizian, Patrizia Oliva, Tomeka Reid (joined by Nick Mazzarella on saxophone & Federico Francioni on whirly tube! ), and Stefano Urkuma De Santis were truly exceptional. Photo by Giancarlo Brunelli. 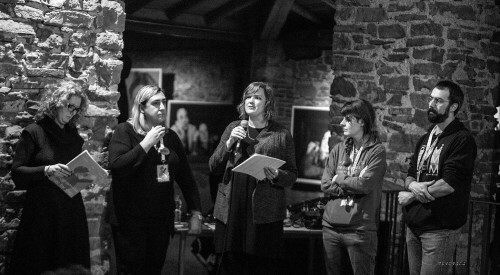 L-R: Curator Karianne Fiorini, BFM translator, CFA curator Michelle Puetz, Giulia Casteletti (Lab 80 film – Cinescatti), Sergio Visinoni (Lab 80 film – Cinescatti & BFM). Photo by Giancarlo Brunelli. Patrizia Oliva performing MEMORIA DATA (Lori Felker & Patrizia Oliva, 2018, 12 min). Photo by Giancarlo Brunelli. 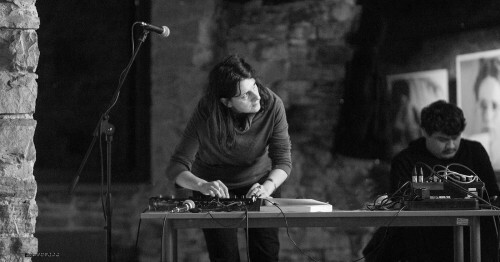 Patrizia Oliva performing MEMORIA DATA. Photo by Giancarlo Brunelli. Stefano Urkuma De Santis performing PARALLAX DASH (Domietta Torlasco & Stefano Urkuma De Santis, 2018, 8 min). Photo by Giancarlo Brunelli. Tomeka Reid and Nick Mazzarella performing OCTAVIA (Federico Francioni/Yan Cheng & Tomeka Reid, 2018, 14 min). Photo by Giancarlo Brunelli. 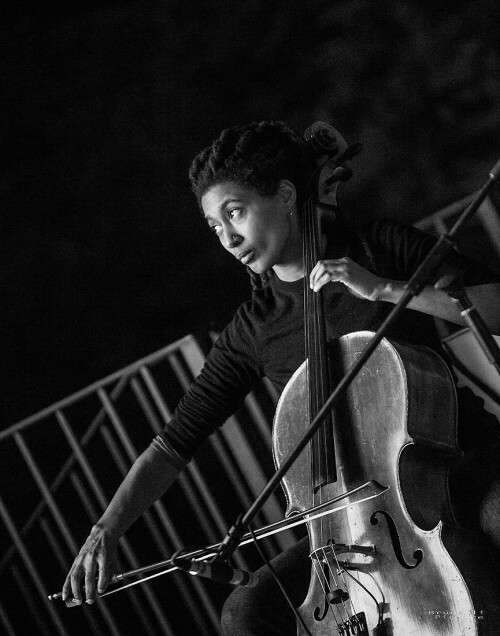 Tomeka Reid performing OCTAVIA. Photo by Giancarlo Brunelli. Alex Inglizian performing TEMPLE OF TRUTH (Giuseppe Boccassini & Alex Inglizian, 2018, 15 min). 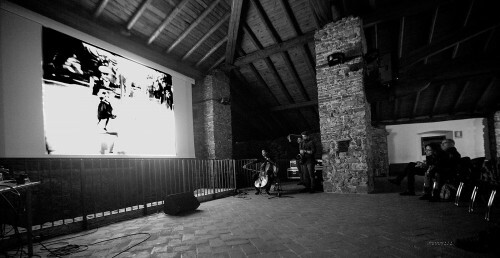 The screening / live performance was followed by a reception (thank you, again, to Lab80 and the Bergamo Film Meeting Festival), and the artists had the chance to relax and talk with the audience. Photo by Giancarlo Brunelli. 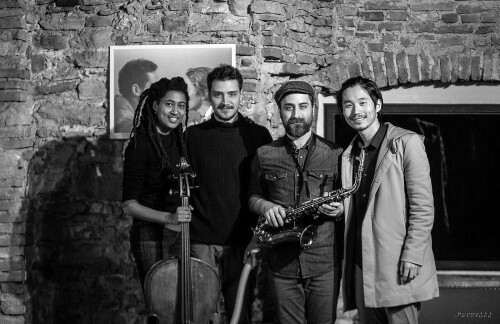 L-R: Tomeka Reid, Federico Francioni, Nick Mazzarella, Yan Cheng. Photo by Giancarlo Brunelli. L-R: Federico Francioni, Michelle Puetz, Alex Inglizian, Nick Mazzarella, Yan Cheng. Relatives of some of the individuals featured in archival material from the Cinescatti collections were in attendance, which was not only a surprise, but incredibly moving. They were so happy to see their family memories honored and transformed through the creation of these new pieces. We ended the evening with a fantastic dinner and lots of hugs. The entire experience was incredible—thank you to our Italian colleagues, and now friends (especially Karianne Fiorini, Angelo Signorelli, Sergio Visinoni, and Giulia Casteletti) for such a memorable experience. We can’t wait to see you again this summer for the Chicago premiere on July 17! Read more about the talented artists we are working with on this project here. The International Media Mixer has been made possible with the generous support of the MacArthur Foundation, the Chicago Department of Cultural Affairs and Special Events, Lab 80 film – Cinescatti, and the Istituto Italiano di Cultura Chicago.